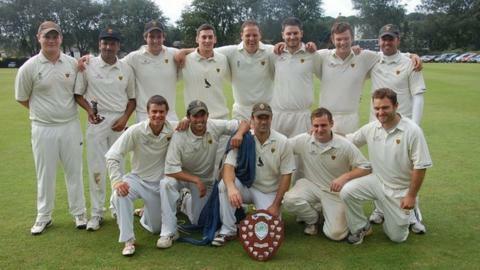 Cornwall beat Buckinghamshire by 150 runs in the Minor Counties Championship final to win their first title. Resuming on 93-3, Bucks collapsed to 111 all out, with ex-Pakistan spinner Shakeel Ahmed taking seven wickets. "It feels fantastic. It's been a long, long wait," Cornwall skipper Tom Sharp told BBC South West. "It was in the balance this morning, although we were slight favourites. The first half hour sorted that out with six wickets for eight runs." He added: "It's been on the cards for a while now. Each year the young players have got better. "We're a young side and hopefully this can be a springboard for us to win things in the next few years. Man of the match was left-arm spinner Shakeel, who returned match figures of 10-109. Sharp backed him up from the other end, ending the game with seven wickets, as the spinners dominated proceedings. "It's a really proud moment for all of us," Sharp added. "I'm really happy for the manager and the selectors, you can really see what it means to them."